Cadillac Girl - ZineWiki - the history and culture of zines, independent media and the small press. 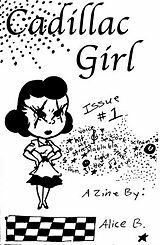 Cadillac Girl zine is a perzine that was created under the pen name Alice B. in 2004. In 2012, the zine started up again with issue #3 under the writer’s real name Mel W. More info on current and past issues are available on the zine’s website. Issue 1: This issue contains thoughts and experiences, like quitting a waitressing job and her mother going away to prison. It also includes work from contributors, like a poem titled 'The Story of a Girl'. Issue 2: This issue deals with a bad break up and confusion. Poems and stories about poverty, insecurities, and a 'Rushed Girl's Wish list'. This page was last modified on 8 July 2013, at 12:11.